There are only a few shopping days left before Christmas. So its time to make your final decisions. If you are looking for some really cute and original toys, then Daydream Toys is a great place to start shopping. Whether you have boys or girls, you can find some really unique items. For our review, we received the Doodle Track Car, and my son thought it was awesome. It comes with a battery powered car that drives around the track, but that is only the beginning. 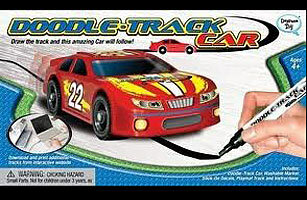 Kids can use any black marker or crayon and make their own tracks, and the little red or blue car will magically follow the line. I have to idea how it works, but it really does work. My son was amazed by it and spent hours playing with it and designing and designing tracks. Another great toy you can find at Daydream Toys are the the Clip Clop Puppets. These little guys are just too cute for words. We received the horse to review. My older kids love controlling the marionette strings and the baby just loves watching it. To her it seems like the horse came to life. And the "clip clop" sound they make every time they touch the floor only enhances the magical effect. Kids will make these puppets dance and play for hours. To get either of these toys or any of the other remarkable products from Daydream Toys, you can visit their website. All of their toys are available in their online store for everyday low prices. They can make your last minute holiday shopping easy and affordable. In honor of the holiday season, one lucky winner is going to receive a Doodle Track Car of their own. To enter, you must become a fan of Daydream Toys on face book. For additional entries, you can do any of the following, but you must complete this initial entry first. Any entries that do not follow these guidelines will be deleted. This giveaway will end at midnight on 12/31/10 and is open to the US only. The winner will be chosen via a random number generator. Thanks again to Daydream Toys for offering this great prize! I follow you on twitter @jessyca81 and I tweeted about this giveaway. I like day dream toy on facebook. I became a fan of Daydream Toys on FB. I'm subscribed to your blog by email. I'm a fan of NAM on FB. I follow on twitter and shared using the link on this page - hisprincess886. I follow your author blog via gfc. Became a fan of Daydream toys. I like daydream toys on fb as Leslie Luke Stanziani.Thanks! Fan of New Age Mama on Fb as Leslie Luke Stanziani.Thanks! I "like" Daydream Toy on Facebook (Jen Voss). I "like" New Age Mama on Facebook (Jen Voss). I follow your author blog on Google Friend Connect as Jen @ blog giveaway directory. I follow authorldeluca on twitter as Greatgiveaways. I "like" Author Laura DeLuca on Facebook (Jen Voss). I added your giveaway to a linky. I am a fan of Daydream Toys via Facebook as Jill Myrick. I am following your Author Blog via Google Friends Connect. I am a fan of your Author Blog via Facebook as Jill Myrick. I like them on facebook. Thanks. I like daydreamtys on facebook "anash ct"
i follow on networked blog "anash ct"
I like new age mamam on facebook "anash ct"
I friended laura deluca on facebook "anash ct"
I like Daydream Toys on FB-tracey byram. I liked Daydream toys on FB! Thanks for the chance!